Greg Eden’s hat-trick of tries on his return to the Mend-A-Hose Jungle helped Castleford Tigers to win the new Harrison-Bryan Trophy as they beat Hull FC 42-10 in their opening pre-season contest. Two other new signings, Zak Hardaker and Tuoyo Egodo, also scored on their debut as the Tigers ran in nine tries before Hull crossed twice in the last 10 minutes. Castleford fielded a strong line-up with all of their fully fit senior players involved along with youngsters from the academy. New signings Hardaker, Eden and Jesse Sene-Lefao all started while new boys brought in with an eye to the future, Egodo and Daniel Igbinedion, were on the bench. With Hull not fielding as strong a side it was no surprise that the Tigers dominated the opening half as they ran in five tries to lead 24-0 at the break. Mike McMeeken and Rangi Chase both went close early on before the opening try came on 11 minutes, McMeeken finishing from close range after taking a clever Chase pass. Paul McShane converted to make it 6-0. Hardaker added to the lead seven minutes later when he backed up well after skipper Michael Shenton cut in well from the left. 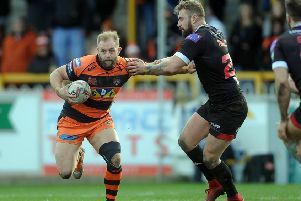 Cas were into their full stride now and quickly went over again as Greg Minikin was left with an easy finish on the left wing after Hardaker supplied the final pass on a good move reminiscent of the Tigers’ left flank moves last season. Hull rarely threatened and were cut open again on 32 minutes when McMeeken’s pass sent Jake Webster charging down the right wing. He made 40 metres before timing his pass inside perfectly for Eden to score on his return to the Mend-A-Hose Jungle. McShane’s second goal made it 20-0. Just before half-time Cas stretched their lead to 24 points as Shenton’s clever offload sent Minikin over for his second try of the day. Hull started the second half better and only good defence kept them out. The Tigers survived their first serious pressure and came out of it with another score of their own. Eden collected a kick on his own line and quickly transferred defence into attack, racing the full length of field and rounding the full-back to come up with a spectacular try. Eden then completed his hat-trick on the hour as he went over in the corner from a Hardaker pass. From the next set Egodo scored after youngster Luke Million had made an immediate impact as substitute with a fantastic break,which was taken on by another academy product, Callum McLelland. The rampant Tigers made it three tries in four minutes when Million this time finished off a move started by Eden and also involving Sene-Lefao. The conversion by Callum Turner made it 42-0. The travelling Hull fans finally had something to cheer as Callum Lancaster collected a kick over the top to collect his side’s first points. Jez Litten then danced his way over from close range for a second Hull try with Nick Rawsthorne adding the extras, but they were second best on the day to a Castleford team for who Hardaker impressed along with the other signings, McMeeken, Rangi Chase and Shenton, who made a successful return to action after missing almost the whole of last season with an ACL injury. Scorers - Castleford: Tries McMeeken, Hardaker, Minikin 2, Eden 3, Egodo, Million; goals McShane 2, Turner. Hull: Tries Lancaster, Litten; goals Rawsthorne. Castleford: Hardaker; Eden, Webster, Shenton, Minikin; Chase, T Holmes; Springer, McShane, Millington, Sene-Lefao, McMeeken, Massey. Subs: Moors, Maher, Egodo, Douglas, Dixon, Fitzsimmons, Igbinedion, Johnson, McLelland, Million, Render, Sheehan, Turner, Westerman. Hull: Naughton; Michaels, Rawsthorne, Griffin, Lancaster; Tuimavave, Wray; Bowden, Hadley, Green, Downs, Washbrook, Thompson. Subs: Turgut, Fash, Matongo, Litten, Osbourne, Lane, Bower, Sanderson, Adlard, Silk, Wood, Lee.